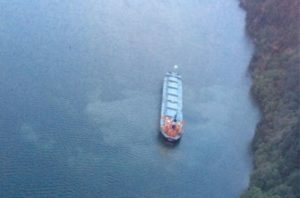 The bulk carrier Rosco Palm ran aground into a sandy shallow at Columbia River near Skamokawa, Washington. The vessel was proceeding under cargo down the stream with close to maximum allowed draft, but due to human mistake left the shipping channel and grounded into a shallow. Fortunately the vessel did not suffered damages and breaches during grounding and was refloated later by a harbor tug. The bulk carrier was towed and anchored near Skamokawa for special survey and inspection. After dropping anchor, the ship ran aground again pushed by the stream into another sandy shallow. There is no report about damages, but was detained until further inspection for seaworthiness. The investigation for the strange double grounding of the bulker is under investigation. According to preliminary information, the vessel has draft closer to maximum allowed for shipping through Columbia River. During the accident there were no injured people and no water pollution. The bulk carrier Rosco Palm (IMO: 9510345) has length of 229.00 m, beam of 32.00 m and maximum draft of 12.70 m. The deadweight of vessel is 82,153 DWT and the gross tonnage is 43,024 GRT. The bulk carrier was built in 2011 by Tsuneishi Shipbuilding in their shipyard in Fukuyama, Japan. The owner and operator of the ship is Chinese company Rewood Ocean Shipping.